One of the principal tributaries of the Jordan; first mentioned in connection with the meeting of Jacob and Esau and with the struggle of Jacob with the angel (Gen. xxxii. 23 et seq.). It was the boundary separating the territory of Reuben and Gad from that of Ammon, the latter being described as lying along the Jabbok (Num. xxi. 24; Deut. ii. 37, iii. 16; Josh. xii. 2). The territory of Sihon is described as extending "from Arnon unto Jabbok" (Num. xxi. 24), and it was reclaimed later by the King of Ammon (Judges xi. 13, 22). Eusebius ("Onomasticon," ed. Larsow-Parthey, pp. 222, 224, Berlin, 1862) places the river between Gerasa and Philadelphia. 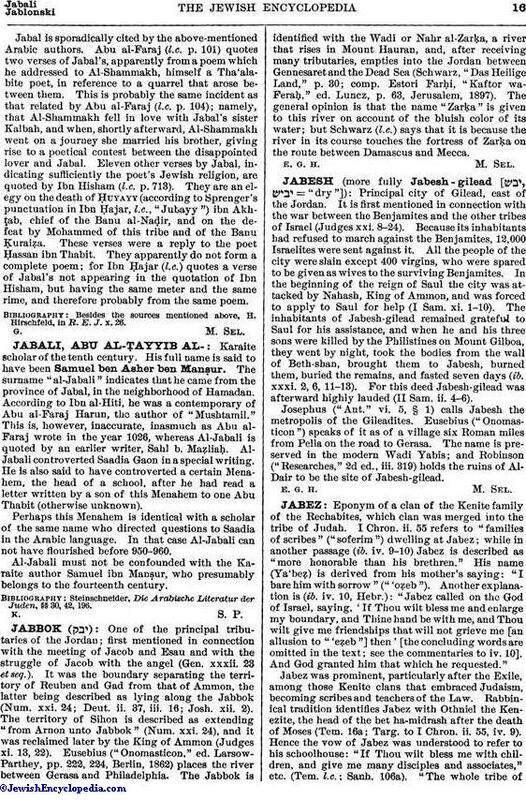 The Jabbok is identified with the Wadi or Nahr al-Zarḳa, a river that rises in Mount Hauran, and, after receiving many tributaries, empties into the Jordan between Gennesaret and the Dead Sea (Schwarz, "Das Heilige Land," p. 30; comp. Estori Farḥi, "Kaftor wa-Feraḥ," ed. Luncz, p. 63, Jerusalem, 1897). The general opinion is that the name "Zarḳa" is given to this river on account of the bluish color of its water; but Schwarz (l.c.) says that it is because the river in its course touches the fortress of Zarḳa on the route between Damascus and Mecca.